Is Ray Kurzweil’s Singularity Event the Future People Want? Turn off the fat insulin receptor gene to stay thin and healthy and live longer. Correct DNA errors and reverse the aging process with “nanobots.” Regrow cells, tissues and organs and introduce them into bodies without surgery. All sounds good but is there a downside? A bloody and mind-blowing tour de force, both literally and figuratively. “State of Mind,” a new book by author Sven Michael Davison imagines a time where a P-Chip, as he has named it, has the capabilities to change who people are. The science Davison portrays in his cyber-fiction novel is extremely plausible and explores the moral and sociological dilemmas of a future predicted by futurist Ray Kurzweil and the Singularitarians that follow him. Set in Los Angeles in 2030, “State of Mind” examines the loss of freedom in a city that has been the setting for some classic post-industrial dystopias. Jake Travissi, the unlikely hero of the story, has been banned from the police force but wins a rare second chance. The price: volunteer to have a P-chip implanted in his brain and join Homeland Security’s experimental Enhanced Unit. Sven has worked as a trailer copywriter at Paramount Pictures and a staff screenwriter for several other smaller production companies. He was head of 20th Century Fox’s Worldwide Home Entertainment Content and Production Department for ten years. When not writing he consults for entertainment technology companies. This is his second novel. 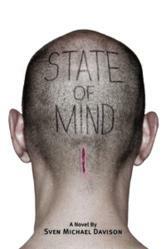 PRAISE FOR "STATE OF MIND"
“State of Mind” is an action-filled, engrossing journey across the tortuous emotional landscape of mind control, where nothing is quite what it seems for everyone involved. A must-read for Pin Heads and God Heads alike and for the casual observers.” -- Leonid Korogodski, author of “Pink Noise"
For more information about Sven and his book, visit http://www.stateofmindbook.com.